Running numbers: 1500 - 1509. Built: 1949 to lot number 373.. 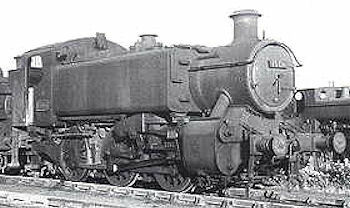 The '1500' class of heavy shunter was an unusual design for the Great Western as it was fitted with outside cylinders, Walschaerts valve gear and no running platform. In addition, most of the separate parts were welded instead of riveted together. With a wheelbase of 12 feet 10 inches, curves of 3½ chains (115 feet) could be easily negotiated. Most of their work was shunting carriages to and from Old Oak Common yard as the majority were stationed there at sometime in their lives, otherwise they worked in the Newport area. The first withdrawal came in 1959 with number 1509 when she was under 10 years old and the last four working examples disappeared in December 1963. One member of this unusual class has been preserved, number 1501, originally withdrawn in 1961. Boiler type Number 10 Boiler pressure 200 lbs/square inch.